Since the beginning of July, 26 bats were submitted to the CWHC in Saskatchewan. These bats were found in people’s houses or on their property, and is a jump in numbers from previous years. Got Bats in your Belfy? Don’t Panic! Don’t handle bats. Rabid bats may show odd behaviour that can result in them being out in daylight hours and/or ending up on the ground. Grounded bats (or any bat) should never be picked up with bare hands. Keep domestic animals away from grounded bats to minimize the risk of contact between the bat and the domestic animal. It is well documented that dogs, cats, horses and livestock can get rabies from bats which can lead to secondary exposure of their owners. Contact your local wildlife officer or CWHC centre. Sick or dead bats should be collected by the local wildlife division and submitted to a CWHC lab so that it can be tested for rabies and assessed for other health problems. If there is domestic animal or human contact, rabies should be treated seriously. If rabies is confirmed in a captured bat that was behaving abnormally, post exposure rabies treatment may be required for the pet and/or any human deemed to have had significant contact with the rabid bat. Always contact your local medical health officer or physician if you have concerns about human or domestic animal contact with a bat. Keep in mind that not all grounded bats are sick. Especially in July and August, when baby bats start flying, they may get disoriented and end up in a living space. These bats are simply lost. This is the case with the majority of the bats that we have seen so far this summer. 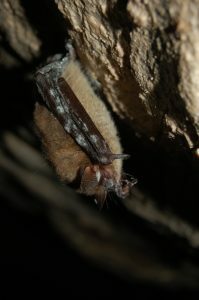 Many bat species across Canada are in trouble due the devastating effects of white-nose syndrome but also because of habitat loss, pesticide use and various means of direct harm. Given their significant role in regulating pest insect numbers, such a drastic decline in bat numbers can have an adverse impact on the environment and the economy. If you find a lost bat on your property, the best thing to do is to leave it alone. If you have bats in your home, these links provide easy tips on how to safety remove them without causing injury to the bat. One of our colleagues, Dr. Mark Brigham, a University of Regina biology professor, has spent over thirty years studying bats. In a recent article, he offers some great advice and dispels some myths regarding bats. Submitted by Marnie Zimmer and Jordi Segers. Photos by Jordi Segers.